HUNTINGTON - For the fourth year, the Jewel City Jam will be bringing two days of eclectic live American roots music to downtown Huntington. 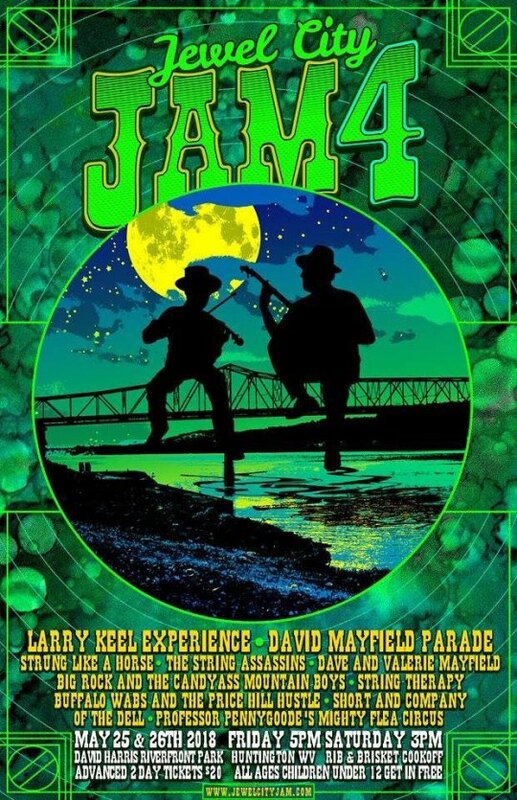 The JCJAM4 that will take place Friday and Saturday, May 25-26 at Harris Riverfront Park will feature a half dozen regional acts on Friday and then on Saturday a half dozen nationally traveling acts. Tickets are $10 for Friday, or $5 if you also bring five cans of food for the food bank. On Saturday, tickets at the gate are $20. Folks are also asked to bring five or more cans of food for the food bank. Children 12 and under are free. There is free camping at the Riverfront, and festival-goers are allowed to bring coolers. Food vendors include: Southside Sliders, shaved ice, as well as five barbecue vendors competing in Saturday's Rib and Brisket smoke-off. There will also be a handful of local arts and crafts vendors. Set times are Friday, May 25: Gates at 4 p.m., BRATCAMB (string band with horns out of Huntington) at 6 p.m., String Therapy (bluegrass from Lancaster, Ohio) at 7 p.m., Buffalo Wabs and Price Hill Hustle (old-time/Americana band from Cincinnati) at 8 p.m., Professor Pennygoode’s Mighty Flea Circus (swing band from Florida) at 9 p.m., Of The Dell (original retro rock out of Huntington) at 10:15 p.m., and Short and Company (blues out of Morehead, Ky.) at 11:15 p.m.
On Saturday, May 26 set times are: Gates at 4 p.m., Dave and Valerie Mayfield (bluegrass duet out of Kent, Ohio) at 6 p.m., Larry Keel Experience (contemporary bluegrass out of Virginia) at 6:45 p.m., Professor Pennygoode’s Mighty Flea Circus (swing) at 7:45 p.m., String Assassins (acoustic, jam-rock out of Florida) at 8:45 p.m., Strung Like A Horse (thrash and punk grass out of Tennessee) at 9:30 p.m., and Dave Mayfield Parade (Americana out of Tennessee) at 10:30 p.m.